Includes $770 single supplement. Second payment: $895 by March 15, 2014 . Saba proudly declares itself "The Unspoiled Queen" referring to her unspoiled nature and inhabitants. The best way to describe this unique island with only 1400 people is to list the "have nots". Saba has no crime, no high rises, no traffic or traffic lights, no pesty insects, no crowds, no fast food restaurants, no casinos, no cruise ships, and no beaches. 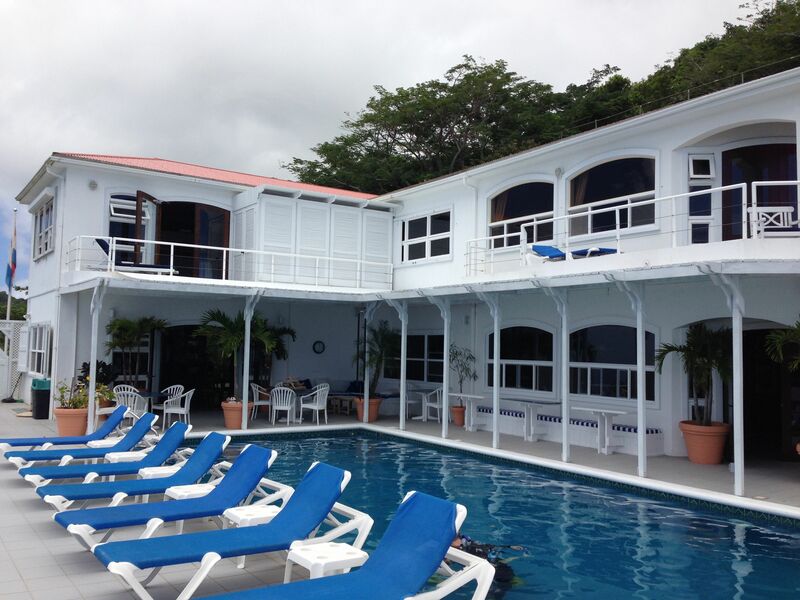 Instead Saba's guests enjoy a choice of small intimate hotels within quaint villages among friendly locals. Saba, unlike some Caribbean islands, is considered to be quite liberal minded when it comes to sexual orientation. Diving is conducted under the auspices of the Saba Marine Park, a model park recognized for its success in protecting the marine environment. Topside Saba is protected by the Saba Conservation Foundation with only a small percentage of the island 'developed' for residential and commercial needs. Ten to fifteen restaurants offer an array of cuisine from outdoor barbeques to fine dining. We have arranged this inclusive deal so that you don't have to worry about anything but enjoy your dive vacation! As a PADI 5-Star Resort, Sea Saba commitment to professionalism and adherence to the highest standards in the industry are a given. Sea Saba’s additional status as a PADI National Geographic Dive Center and Sea & Learn founding sponsor further demonstrates their dive team’s genuine commitment to nature and its exploration. In addition to taking us diving the Sea Saba team is involved in community outreach, reef surveys, coral monitoring, and other educational programs. Sea Saba utilizes a custom made filtration system that starts with a specifically engineered moisture separator. The air then passes through four-in-line filters before reaching the tank. Sea Saba's boats have all standard safety equipment on board including VHF radios, cell phone, oxygen, first aid, and flare systems. Two instructors crew each of the boats so that there is always surface support and an experienced in-water guide available on each dive. Sea Saba utilizes a "boat computer" so that the dive guides have the information to assure planning and conducting of dives based on the most conservative profile for all divers. They also conduct and document quarterly emergency rescue and safety scenarios. Note: at this time, there is no routine hyperbaric treatment on island so be sure your DAN or other diving insurance is up-to-date. 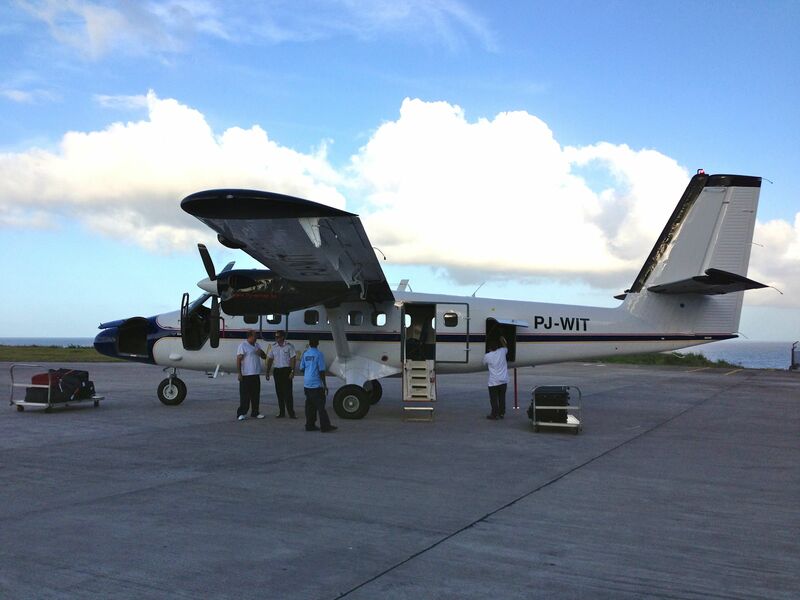 Sea Saba recognizes the needs of experienced divers. Most of the divers find diving with their guides a pleasure--knowing they have the knowledge and experience to find more marine life but never overbearing or condescending. However, if you prefer to dive as a buddy team and do your own thing, they'll give you that freedom provided you follow our basic safety guidelines. They'll neither make you play "follow the leader" nor will they make you come up from a shallow dive to fit someone else's hectic schedule. If you're a new or novice diver, their experienced instructors will make you comfortable in no time so that you can fully explore and enjoy the underwater magic of the Saba Marine Park. A taxi will pick us up at the hotel shortly before 9 a.m. The boat will depart the harbor at 9:30-10:00 a.m. We will have ample surface intervals of 60-90 minutes to be sure we have plenty of time to do nice second and third dives. The boat will return to the harbor about 3:00 p.m. Sea Saba has a night dive planned every Tuesday, Thursday and Sunday provided they have at least 4 divers (night dives are extra). Water temperatures in June are expected to be between 75 and 80 degree Fahrenheit. 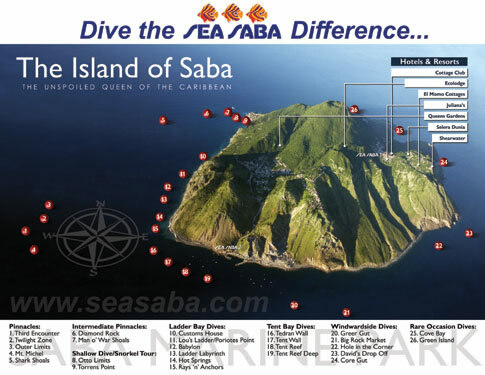 The Saba Marine Park now boasts more than 30 permanently moored dive sites, which means that we won't dive the same dive site twice during our day unless we want to, and there are sites that are worth more than one dive. Saba’s volcanic origins have blessed her waters with spectacular formations and structural diversity. From shallow patch reefs to deep water seamounts, Saba offers interesting diving at each depth and for every diver's experience level, although the best dive sites (pinnacles) are on the deep side. The Saba Marine Park ("SMP") was established in 1987. One of the few self-sustaining marine parks worldwide, it’s important to note that it was not established to help repair a damaged environment and ecosystem, but rather to safeguard and ensure the continued quality of an extraordinary resource. 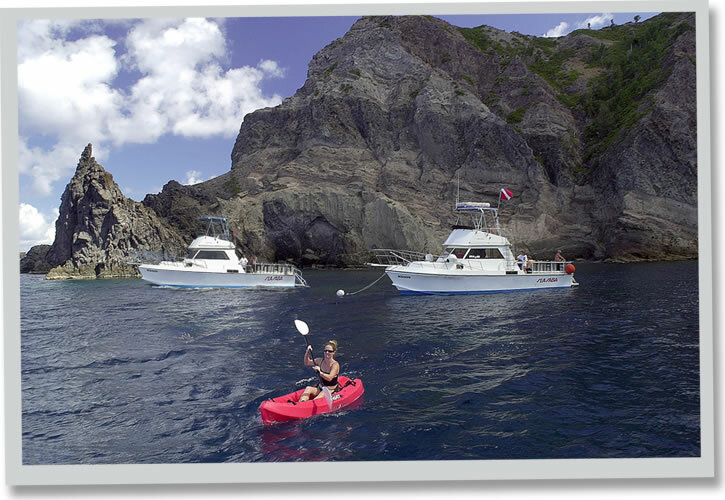 Not far offshore, Saba ’s famous pinnacles and seamounts, Third Encounter, Twilight Zone, Outer Limits, Mt. Michel and Shark Shoals rise dramatically from the depths to within 85 feet of the surface. These depths have protected them from any natural storm damage and, of course, anchors. The mere size and abundance of large sea fans and sponges put the pinnacles at world class status even without the added bonus of reef creatures and fish. The structures themselves are not to be missed with the most unique being The Eye of the Needle, just off in the deep blue from Third Encounter. It’s common to encounter schools of tropical fish, jacks, groupers or even members of Saba's robust shark population. Although these dive sites are virtually bottomless, they can be safely enjoyed with 100 to 120 foot dive profiles (30-40m), well within the limits of recreational diving. Man O’ War Shoals, Diamond Rock and Green Island are also classified as pinnacles but have sandy bottoms at between 70 and 80 feet. Although pelagics are not as common at these shallower pinnacles, more bottom time let’s you absorb and explore the many nooks and crannies that are home to every imaginable species. The currents, that sometimes prevent diving these sites, yield plankton rich waters for the inhabitants that line the cylinder style walls of these two pinnacles. Schools of blue tangs, big eyes and juvenile barracuda frequent these areas. The dark volcanic sand around these sites is home to many interesting critters including flying gurnards, batfish, industrious sand tile fish and jawfish. Traveling in a westerly direction down the leeward coast brings you to that area referred to by Sabans as The Ladder. Perched precariously on a steep cliffside are the original steps used by islanders to access Saba. The original custom house remains. Prior to the building of the Fort Bay harbor, goods were brought to the island by landing long boats on the rocky shoreline with stout and hearty Sabans carrying the goods by foot up the nearly vertical stairway before reaching the road leading to the village of The Bottom. As such, dive sites off this shore are referred to as Ladder Bay: Custom House, Porites Point, Babylon, Ladder Labyrinth, Hot Springs, Ray 'n' Anchors. Volcanic lava flow has created a natural labyrinth of spur and groove formations. If you still question Saba’s volcanic origins, you can place your hands into the sulfur stained sand and feel the warmth of this now dormant volcanic island. Nurse sharks, turtles, mated whitespotted filefish and even the occasional tarpon are some of the larger animals you may meet face-to-face on the leeward coast. The sea grass on the perimeter of the reef provides sustenance for Saba's healthy sea turtle population as well as garden eels, spotted eagle ray or seahorses. Ladder Bay is also one of our favorite areas for night dives. Less than five minutes from Fort Bay, the only harbor, Tent Bay offers spectacular diving at Tent Reef Deep, a small but interesting reef. Dives at the vertical Tent Reef Wall can be conducted as a shallow dive, a deeper multi-level dive or as an exhilarating drift dive. The sandy top of the wall is home to hundreds of garden eels, razor fish and southern stingrays. A three dimensional mural of colorful mollusks, large barrel and drooping sponges are guaranteed on this dive with the schools of sergeant majors, queen angelfish, french angelfish, frogfish and of course, Buddha, the resident barracuda who likes to hang out with divers and is naturally curious. The swim through at Tent Reef is a treat day or night with yellow cup corals, black coral, a family of black margates, and spiny lobsters. The resident dog snappers have learned to follow night divers and attempt to hunt prey with the assistance of your dive lights. Tent Reef is a favorite for night dives with frequent octopus sightings and a chance to see a manytooth blue conger. More dependent on weather conditions are the Windwardside sites: Greer Gut, Giles Quarter, Big Rock Market, Hole in the Corner, David's Dropoff, Core Gut, Cove Bay. 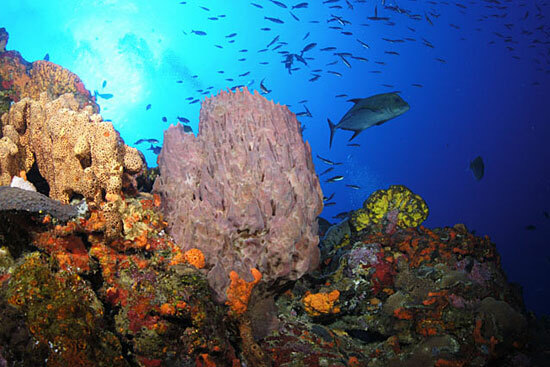 The majority of Saba’s diving offers volcanic coral encrusted boulders with only a few Windwardside sites being true coral reefs. The white sand bottoms in these areas give them a different look and feel from the leewardside sites, and serious fish watchers will note different species of reef fish and critters than seen in other areas of the Saba Marine Park. The exposure to the Atlantic side lends itself less to soft corals but yield grand hard coral structures of elkhorn forests, large plate and mushroom shaped star corals, and brain corals. These formations set the background for nudibranch, frogfish and seasonal juvenile activity. It’s rare to have current on this side of the island and visibility tends to be exceptional. Shearwater Resort is Saba’s only boutique luxury resort with unsurpassed full panoramic views of the crystal blue waters of the Caribbean Sea, the island of Saba and her neighboring islands. Shearwater Resort offers spacious guest rooms and baths with tropically chic décor and modern and luxurious comfort. Shearwater Resort is gay-owned and operated. 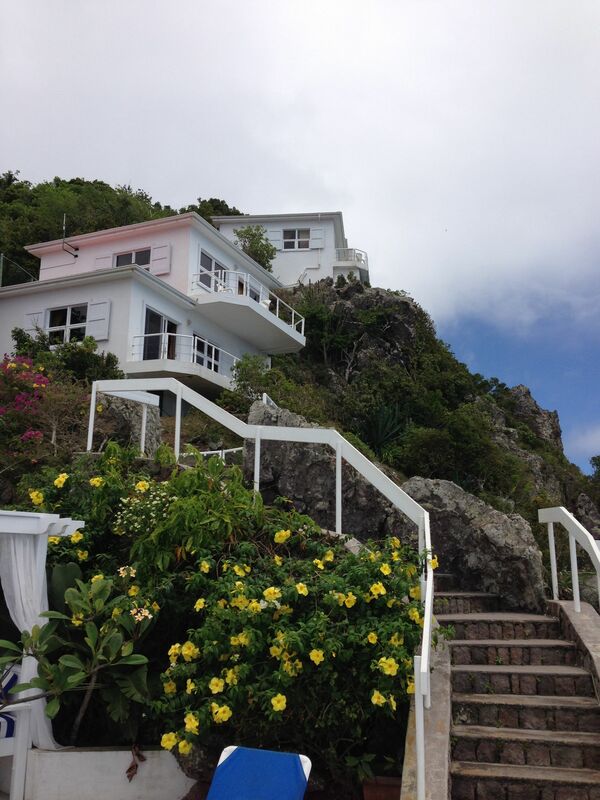 The resort is located on Booby Hill, a 15-minute walk from the village of Windwardside, and has a steep driveway. Taxis are available for about $7. All rooms have Satellite HDTV, DVD/CD/IPod surround sound, refrigerated personal bar, in-room coffee/tea service, in-room safe, memory foam mattress, down duvet and pillows, superior quality linens and towels, thick terry cloth robes and hairdryer. Note that none of the rooms have air conditioning. Bistro del Mare, the award winning restaurant, martini bar and lounge at Shearwater Resort is just one of the special amenities you will enjoy. Other amenities include tennis court, fitness center with free weights and cardio equipment, oversized pool and sun deck and jacuzzi. Note that the resort has only 1 room with separate beds, and therefore it is possible that you will have to share a bed with your roommate. Please keep this in mind if you are signing-up for the trip as a single, and indicate if you are willing to share a bed in the registration form. Breakfast will be served daily at the hotel and is included in the package price. A lunch box will be provided on dive days and is also included in the package price. Dinner is also included in the package price and will consist of a combination of dinners at the hotel as well as local restaurants in the village of Windwardside. 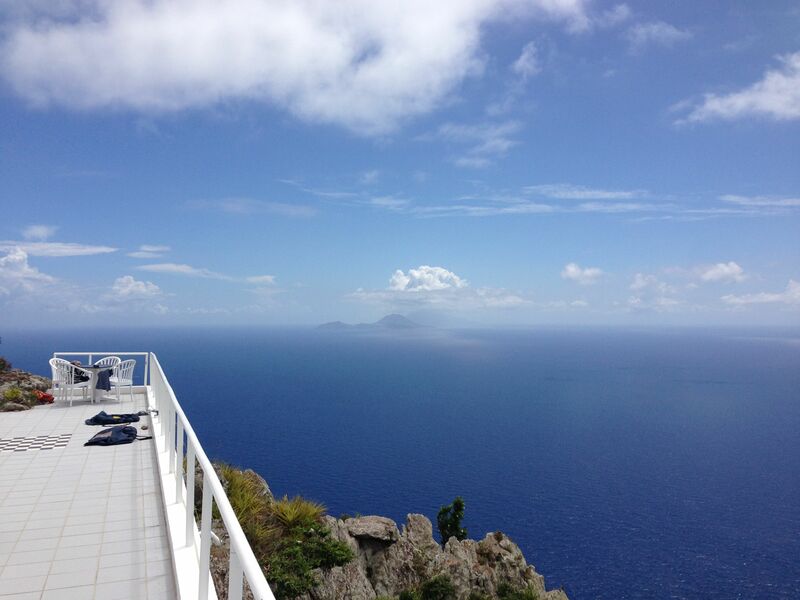 You should plan to arrive in Saba on Saturday May 31, 2014. Depending of your location, you may need to start traveling on Friday May 30, 2014. You will need to fly into Princess Juliana's airport (SXM) on Saint Maarten/Saint Martin which is located 28 miles from Saba. Many US airlines have direct flights from the US to SXM such as United, Delta, US Air, and Jet Blue. When booking your flights/ferry ride, make sure that you have sufficient time in Saint Maarten to connect to your flight or ferry ride to Saba. I would recommend 3-4 hours. If the airport is not busy, you can walk to the beach and watch the planes land/take off at SXM, which is a fun way to pass time. 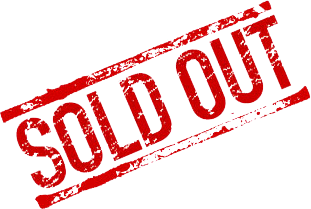 Please do not commit to air flights or other logistical arrangements until you have received confirmation of your space from the Trip Leader once your initial deposit has been received. If we do not have at least 8 divers committed to the trip by January 31, the trip will be cancelled and your deposit refunded.